Today's card is a pretty simple one, so while I have your attention I want to take a second to share a little about why my posts have been so sporadic lately. If you've subscribed to my blog for a very long time, you know that I like to post at least 4 times a week, but for a while now, I've been lucky to post once a week. I know, I hear ya'! Well, I am still stamping, and I am still working, but like so many of you, life sometimes gets overwhelmingly crazy and I have to remember my priorities - God and family first. I'm finding out pretty quickly that the older Emma gets, the more she needs me. And really, that's why we chose for me to work from home in the first place, so I could be the Mom that she needs. And now, it seems, I'm to be mom as well to my Mom. When we were in Fiji, she was hospitalized and just yesterday she was cleared to go to a rehab center to begin her recovery and treatment. Mom has been diagnosed with Leukemia. She will begin treatment in the next few weeks, but the reality is that it is incurable and she will never live on her own again. I know you, and you've prayed me through some tough circumstances before and once again I'm asking for your prayers. Prayers for strength, wisdom and courage. Not just for me, but for my Mom as well. It was the hardest thing ever to leave her in the rehab center last night, but for now, I know it's best so she can begin to regain her strength to face what's ahead. Thanks so much in advance for praying - you are all so awesome! 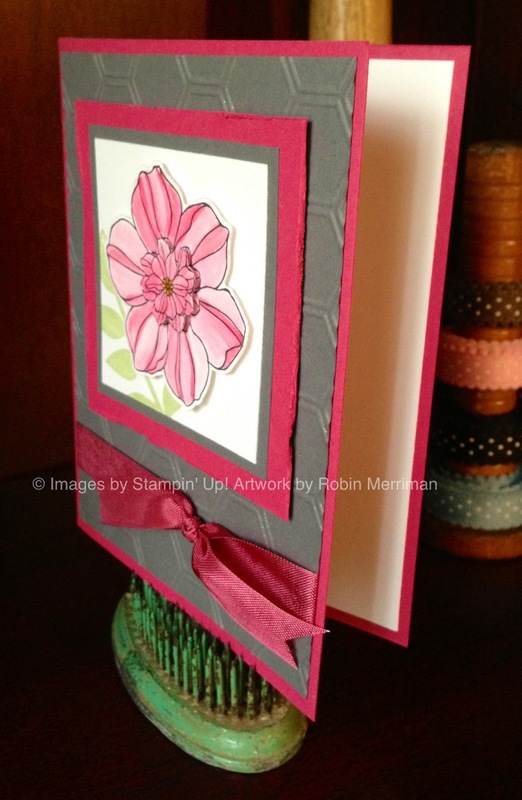 I used the Secret Garden stamp set and framelits, which are carrying over into the new Catalog, for this one. It's loosely cased from a swap card I received in Fiji, but I changed it so much, I don't even remember how the original card was - LOL! This was my farewell to Rose Red - I just love it paired with Basic Gray and here was no exception. 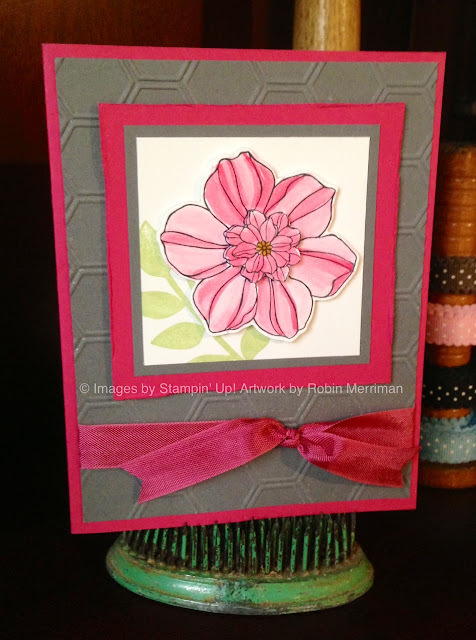 The flower was stamped in Black Staz-On ink and then watercolored in with my Aqua-Painters and Rose Red ink. I painted ink darker on the lines in the flower then moved the color around with my brush to get the lighter tones. For darker shading, I simply added a bit more ink on top of what was already colored. Just be sure to not use too much water, since this is Whisper White cardstock and not watercolor paper, it can pill very easily with too much water. I did stamp the flower twice and used my Paper Snips to trim out the center of the second one, layering it on the larger. The center was colored with a More Mustard Stampin' Write Marker. It's hard to see, but I used my Bone Folder to lightly distress the edges of the Rose Red cardstock square layer - an older technique that was fun to do again. The background of Basic Gray was spritzed with some homemade smooch made from Frost White Shimmer Paint and Rubbing Alcohol in one of my Stampin' spritzers. Hard to see in the photo, but it's there, trust me! And lastly, a final touch of Rose Red Seam Binding Ribbon. Sigh. Such a pretty color, but it's been around a while so we need to make room for some gorgeous new colors too. Thanks for stopping by today, and for all your love and support. Once you're there, just click the link at the top right corner to SHOP NOW. And don't forget to check out the Retiring Items and Clearance Rack - lots of bargains there, so don't miss out. Your card is lovely.....and I am praying for your family! So hard when you hear difficult news, but we know that God is in all the details and His hand is on you all.